Delicious food is part of the Healthy Solutions® Weight Management program, and the meals and snacks are loaded with essential proteins, vitamins and minerals. Mac and Cheese with Butternut Squash: Tender elbow macaroni smothered in a rich and creamy butternut squash and cheddar cheese sauce. Try it with butternut squash, peas, kidney beans, broccoli or tomatoes. Whole Grain Medley with Chicken: A delicious and robust combination of five different whole grains, herbs, and vegetables tossed with pieces of tender chicken. Delicious with spinach, black beans, chickpeas, tomatoes or carrots. Lentil Stew: Tasty lentil and vegetable medley in a savory brown sauce. Only 170 calories. Penne Pasta with Meatballs in Sauce: Penne pasta with Italian meatballs in a traditional red sauce. Only 240 calories. Steak Strips with Red Potatoes and Sauce: Tender slices of seasoned steak with roasted red potatoes, mushrooms, green beans, and corn with a savory brown sauce. (Made without gluten.) Only 180 calories. Vegetarian Thai Curry with Brown Rice: Tasty blend of brown rice, hearty meatless protein and vegetables in a mild curry sauce. Chicken Creole with Brown Rice: Delicious chunks of chicken with hearty brown rice in a zesty tomato sauce. (Made without gluten.) Only 230 calories. Beef Stroganoff with Noodles: Strips of lean beef, egg noodles, and mushrooms in a flavorful cream sauce. Only 250 calories. Lasagna & Meat Sauce: Lasagna layered with a delicious blend of cheeses and classic vegetables in a tasty meat sauce. Only 250 calories. Mushroom Risotto: Creamy wild and white rice with mushrooms and red peppers in a flavorful cheese sauce. Only 240 calories. Pasta Fagioli (Vegetarian): Traditional hearty mix of penne pasta, beans, carrots, and tomatoes in a savory brown sauce. Only 210 calories. Chicken Pasta Parmesan: Tender chicken and pasta shells in a classic Italian sauce flavored with Romano and Parmesan cheeses. Only 200 calories. Cheese and Basil Ravioli with Tomato Sauce: Delicate pasta filled with a flavorful blend of cheese, basil and spices in a red sauce. Only 180 calories. Chicken with Barbecue Sauce with Rice and Beans: A tender, boneless chicken fillet smothered in a tangy barbecue sauce, served with white rice and pinto beans. Only 270 Calories. Vegetable Stew with Beef: A full-flavored stew combining tender chunks of beef with farm fresh potatoes, onions, carrots, peas and celery. Only 140 calories. Five-Bean Casserole: A fiber rich combination of red beans, black beans, white beans, chickpeas and lentils in a mild, chili flavored sauce. Try it served over a baked potato for a real treat. Only 240 calories. We call it peanut butter’s second generation because it’s unlike any peanut butter you’ve ever experienced. 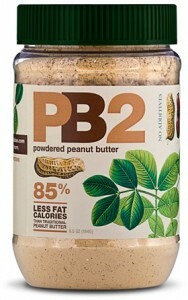 When you mix water or a favorite drink with PB2 you get the same consistency as full-fat peanut butter, with all the roasted peanut flavor, but 85% less calories.